Have you always wanted to try your hand at flower arranging? Our flower design workshops are aimed at a basic level of flower arranging. We want it to be a fun, relaxed environment that you can enjoy, while in the process, creating a beautiful flower arrangement to take home with you. The price of the workshop includes all materials – unless otherwise noted. All workshop participants will receive an information packet on flower and/or plant care & handling as well as flower arranging basics. Please feel free to call and schedule a private workshop for eight or more children or adults. We can customize your workshop to any type of flower arranging, terrarium planting or garden care that you are interested in learning. Sign up for our workshops here! Celebrate springtime, cider and flowers with us at Blue Bee Cider on May 1st! May Day (May 1st) is a day that most of us do not observe. 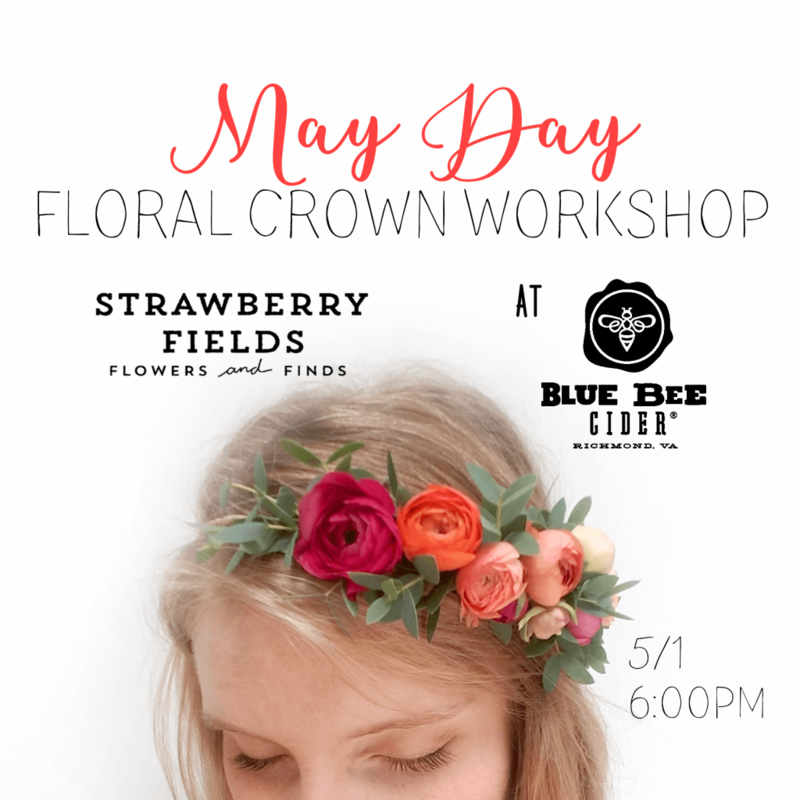 We want to start a new tradition to honor this holiday by making floral crowns, tasting delicious craft cider and enjoying the beautiful weather! Historically, May Day is the celebration of springtime with a festival of dancing, singing and cake. Some May Day celebrations also include dancing around a Maypole adorned with a crown of fresh flowers. We won't have a Maypole but we will make crowns! 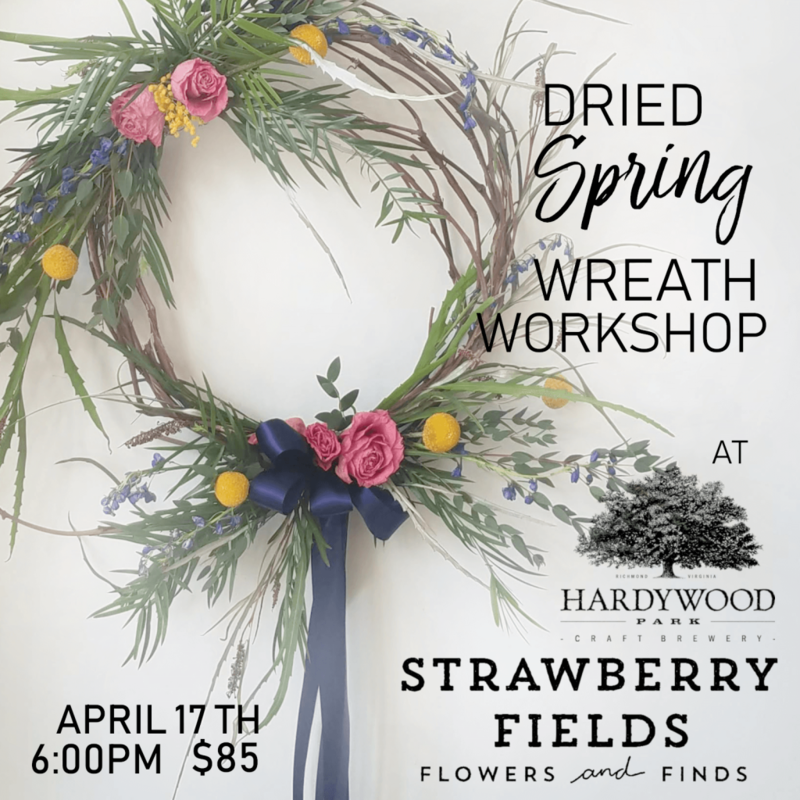 During this hands on workshop you will learn the basics of design, assembly and construction of a floral crown. Each participant will create their own one of a kind fresh floral crown to take home. We will make sure you leave with the skills and knowledge to create a crown at home for your next special night on the town (or even for your own wedding!). An Early Mother's Day experience gift. For Brides and Bridesmaids planning on making their own crowns for an upcoming DIY wedding. Or just because...who doesn't want to make and wear a floral crown! To learn more about our wonderful hosts, Blue Bee Cider, visit their website here. All materials and instruction provided. No experience is necessary and all ages are welcome. You must sign up online to attend. This workshop will hopefully take place outside on Blue Bee's patio depending on the weather. If it is raining we will hold the class in the Hayloft which is only accessible by stairs. If this is an issue for you please let us know so we can change the location.